I’m not usually compelled to rework classic favorite recipes, but one evening after a friend ordered a meal of fresh Thai rice paper spring rolls with a spicy peanut dipping sauce, it occurred to me that it might be fun to revise a simple peanut butter cookie to reflect some of the flavors found in the Asian sauce. If you like the taste of salty peanuts combined with a bit of heat, you’ll most likely enjoy this riff. 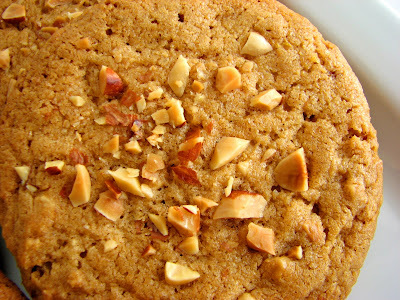 The cookie is crunchy with lots of peanut flavor and is not overly sweet. The cayenne doesn’t hit you until the end of each bite. It’s a classic favorite that’s only slightly different. Have no fear! - Dried coriander is made from the seed of cilantro parsley and has a light lemony note. Beat the butter, both sugars, salt and lemon zest until light and smooth but not fluffy. 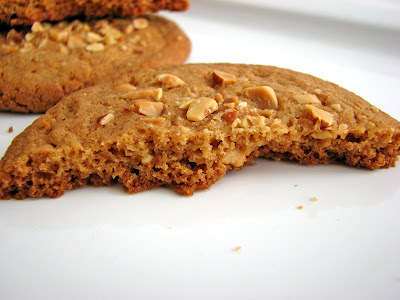 Scrape down the sides of the bowl and add peanut butter and vanilla. Blend until smooth. Add the egg and combine well. Add the dry ingredients and mix just until the dough comes together and there are no streaks of flour. Form the dough into 1 1/2” balls. Chill until firm. Preheat the oven to 350 degrees. 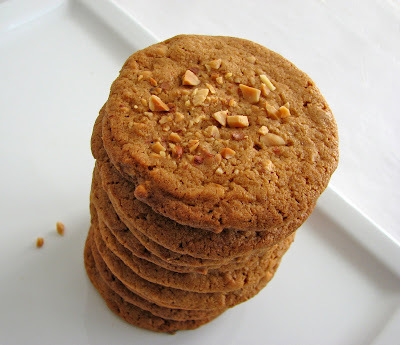 Place a dozen cookies on a baking sheet lined with parchment or a silpat. 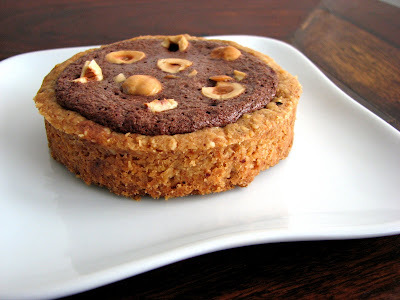 Flatten the cookies with your palm or a fork and press some chopped peanuts onto the tops of each. Bake for 10 – 12 minutes. Cool completely and store in an airtight container. 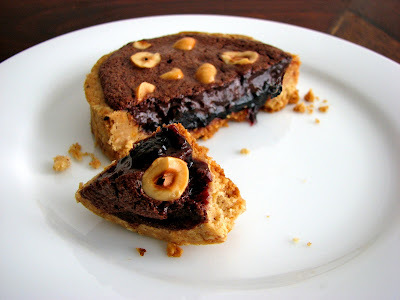 It’s time for a rush of chocolate and whenever I think of chocolate I more often than not think of hazelnuts. It’s a deep default association I have due to my affection for gianduja, the Italian perfection. While chocolate pairs so terrifically with lots of wonderful nuts and fruit and spice, in my world hazelnuts are one of the great stars in this line-up. 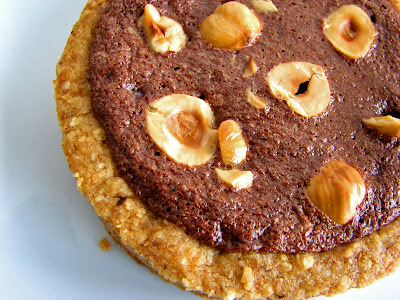 My tart starts with a hazelnut spice pastry shell into which a layer of barely baked chocolate is nestled. And in keeping with my ever present desire for fruit, I add a thin layer of homemade blackberry preserves from the peak of last summer. The crumbly and nutty texture of the pastry conspires with the oozy gooey chocolate and jammy fruit to create a rich bite of dessert to please each of the chocolate lovers in your circle. - Toast 1 1/4 cups of hazelnuts in a single layer in a 350 degree oven for about 10 to 15 minutes or until lightly browned and the skins look cracked. Watch them carefully as hazelnuts can turn bitter if toasted too long. Remove from the oven and wrap the hazelnuts in a kitchen towel to let steam for 1 minute. Then rub them together to loosen and remove as much of the skin as possible. Cool completely. - Melt the chocolate and butter in a bowl over a bain marie (or water bath) that is at a very low and slow simmer to prevent scorching. - The egg yolks for the filling should be at room temperature, but don’t crack them until you’re ready to use them or they will form a skin. - You can omit the preserves or add your own favorite, such as raspberry, apricot, black currant, plum or fig. Or maybe tuck in a small dab of caramel or some sliced bananas. When fresh berries are in season, they would be perfect. 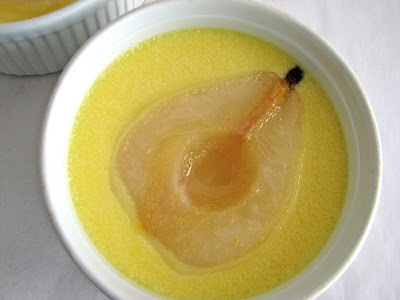 You can also add a little splash of rum, brandy, port or liqueur to the filling for another dimension if you so choose. Just add to the ingredients to be melted over the bain marie. For the pastry dough, place the flour, hazelnuts, sugar, salt, cinnamon and orange zest in the bowl of a food processor and pulse until the nuts are pretty finely ground. Cut the cold butter into small pieces and add to the flour mixture. Pulse just a few times until the mixture resembles coarse meal. Add egg yolk and vanilla and pulse just until the dough begins to clump. Pour out onto a piece of parchment or plastic and gather the clumps together with your hands until the dough is smooth. Press the dough into a thin even layer of a 9” tart pan or 6 individual tartlet pans. Place in refrigerator until completely chilled. Preheat the oven to 350 degrees. Line the tart shell with parchment and weights and bake for about 20 – 25 minutes or until lightly browned and crisp. Remove from oven and cool. Spread a thin even layer of jam over the bottom of the tart shell. Lower the oven to 325 degrees. 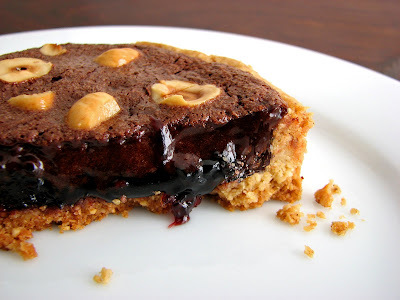 To make the filling, chop the chocolate and butter into small pieces and place in a heatproof bowl along with the salt. Place the bowl over a slow simmering water bath, stirring gently to combine. 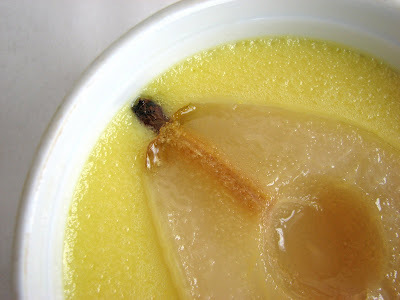 Once the mixture has melted, remove from heat and cool. Using the whisk attachment, beat the egg yolks and sugar on medium high a few minutes until the mixture is thickened, very light in color and tripled in volume. It should hold a ribbon for a few seconds before dissolving back into the bowl. Gently fold about a third of the egg yolk mixture into the chocolate. Fold in remaining yolk mixture. Pour into the tart shell. Garnish with chopped hazelnuts, gently pressing down just a bit to secure them. Bake for about 10 - 11 minutes until the surface of the chocolate is a bit dull and only slightly puffed. Serve warm or at room temperature. It’s hard to describe how incredibly, mind-numbingly good these little Custard Tartlets are. They look innocent enough, nothing more than a flaky buttery crust with some luscious pastry cream tucked inside. But oooh-me-oooh-my do they ever pack a ton of flavor and satisfaction in a very little bite. 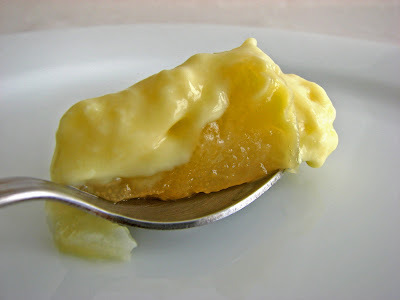 I’ve never considered myself a custard person, but that may be about to change. I’ve been wanting to make these for a long time, but just never made a point of doing it. Since my two best dim sum buddies were coming to dinner, I realized I must try to duplicate their favorite little nibble at the end of our Sunday morning feasts. Now I’m wondering what took me so long to experience this magic. Sometimes the simplest things are the best. It’s no wonder that some version of them are found in many different cultures. They are even said to have been served at the coronation banquet of King Henry IV in 1399. I think I now very clearly understand the expression, fit for a king! - You can make both the pastry dough and the cream and store in the refrigerator overnight. - When rolling out the pastry, always rotate the dough after each roll to make sure it isn't sticking. Gently lift with a dough scraper or spatula if necessary. A piece of parchment helps to cut down on the amount of flour you use. 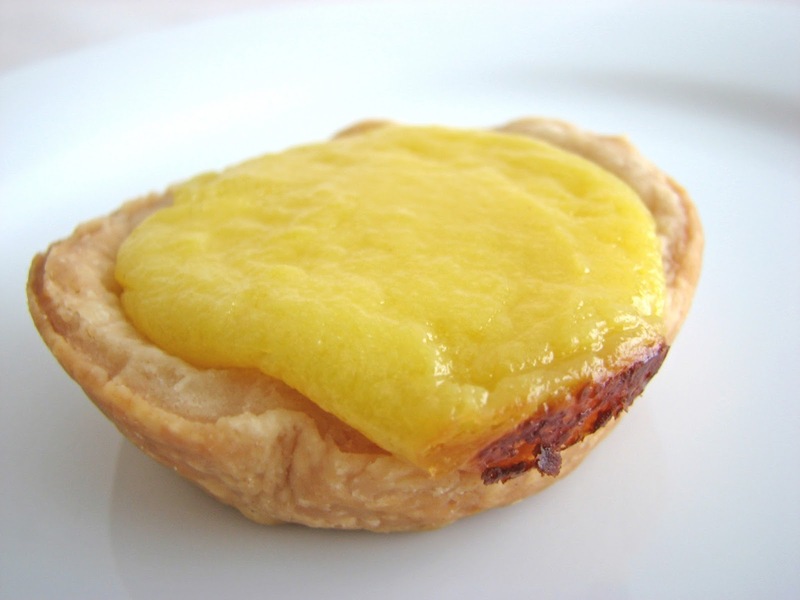 - This is a luscious pastry cream that you could use on its own unbaked. 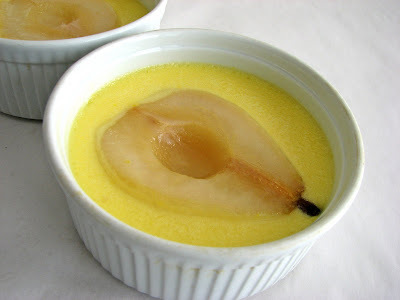 Creamy with great flavor, it can serve as a filling for cakes or a little garnish for cookies and fruits. The rum adds a richness without tasting of alcohol. 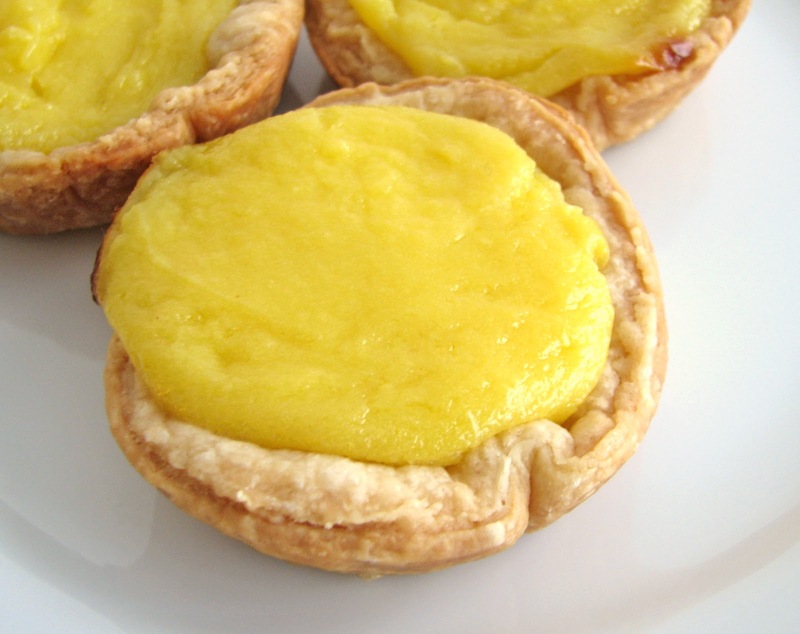 - These tartlets should be eaten on the same day they are baked. For the dough, place the flour, sugar and salt in the bowl of a food processor and combine. Cut the cold butter into small pieces and add. Pulse a few times just until the butter is in small pea-sized pieces and the mixture resembles a very coarse meal. Add the cold water and pulse just until the mixture starts to clump. Pour the dough out onto a sheet of plastic wrap and gather it into a flattened disc. Wrap and refrigerate for a couple of hours or overnight. 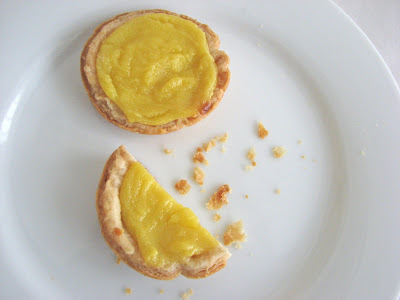 Prick the bottom of the tart shells with a fork. Bake for about 12 minutes or until slightly browned and crisp. Eat them quickly before you have a chance to come to your senses.